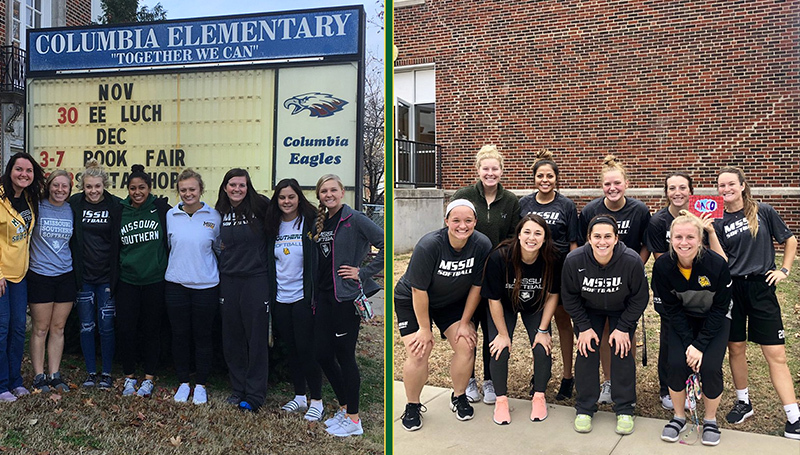 The Missouri Southern softball team spent an entire day at Columbia Elementary supporting one of their own in school principal and MSSU Athletics Hall of Famer Shally Lundien. “The sophomores had to pick what we wanted to do and figured why not give back to someone that came from Southern.” sophomore outfielder Lynnlee Parrott said. A former All-American and MIAA Player of Year, Lundien played two years for the Lions during the 90s’ (1994-1995) after transferring from Crowder College and remembers her experiences of giving back as a player and saw this as the perfect opportunity to allow the current Lions’ team to touch the lives of kids now. Members of the squad split into two groups for the morning and afternoon sessions while covering all grade levels (K-5) and helping fellow teachers as assigned. They read stories, colored cutouts of Christmas themed elements (trees, stockings, elves, etc. ), assisted in worksheets, played outside with the kids, and competed in a hoop hop showdown that combines hopscotch and rock, paper, scissors leading to an amazing time of building teamwork and getting everybody involved. “We loved it, anytime we can help we are more than happy getting the community involved with Southern. Parrott concluded.